After I discovered Insuflon existed, I took to google to find out a little more. 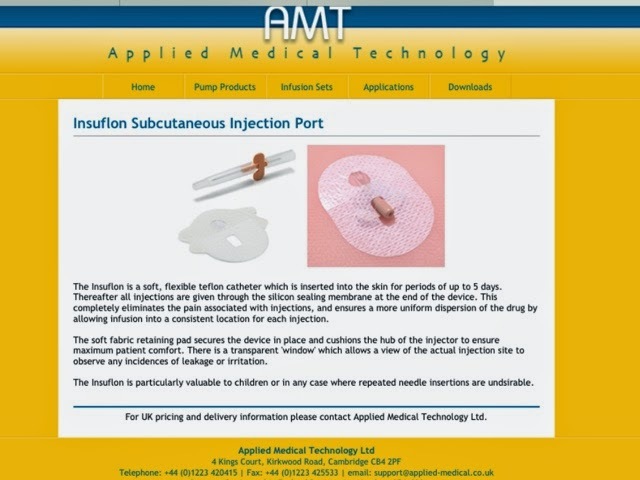 I found AMT "Applied Medical Technology" who would be a distributor of a Insuflon to find out a little more about it. AMT were very helpful with the information I requested and they sent me out a box of them to try so Id know exactly what they were like. Within a few days my samples arrived and after ripping open the package ( I love getting packages ) I had a good look at them, o and a good read of the literature that came with it. My very first reaction when I inspected the goods was, "that needle is a little big" in length, not width. The Insuflon has no applicator, it's a manual application without buttons to shoot it into place. I can honestly say there is no pain involved. The cannula is tiny, soft and a little longer than Iv used before, Id say kinking would be unlikely. I felt nothing while wearing it, it's extremely comfortable. 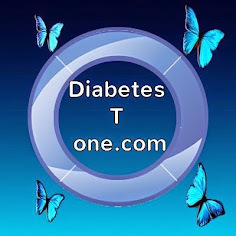 As I found before, using a devise like this does help improve blood glucose. My opinion for this, and it's only my opinion is that after injecting directly into skin, even after holding the needle there for 10 seconds after injecting, you still get that drip on the end of the needle after you withdraw it from your chosen injection site. It's nearly a unit of insulin in that drip so we don't get the full advantage of the injection of insulin we have just administered. Basically if your carb counting and (example) inject 6 units to cover the carbs in your meal, it's less than 6 units your actually getting, it's more like 5ish units. However, when injecting into Insuflon or other cannula type device, as you withdraw the needle after administration, you pull it back out from / through a membrane or seal that extracts that last drip while still inside the cannula device. The result ? Units of insulin injected completely, and entirely, so your carb counting works. The 1st insuflon I placed in position, was on the right side of my tummy with the membrane / seal pointing outwards toward my hip. This made injecting awkward, so my second application was more thoughtfully placed with its membrane pointing upwards, so I could inject directly down into it and I found this a less awkward situation. The Insuflon it small, neat and very discreet, so because its small and discreet I found I needed my reading glasses on to correctly target the membrane with my needle. 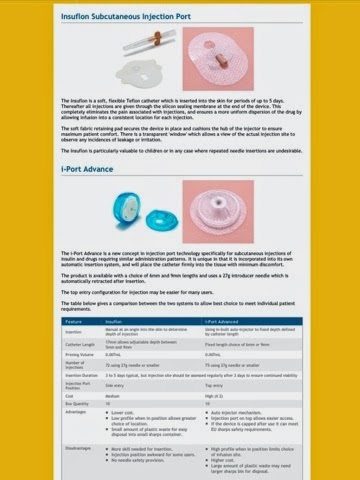 I wish the Insuflon and the Iport were available on our LTI scheme in Ireland. As well as better BG control, it means breaking skin only once every 3-5 days instead of 5 + times a day, every day. As a last word, the Insuflon fitted in with my lifestyle very well and with no problems.